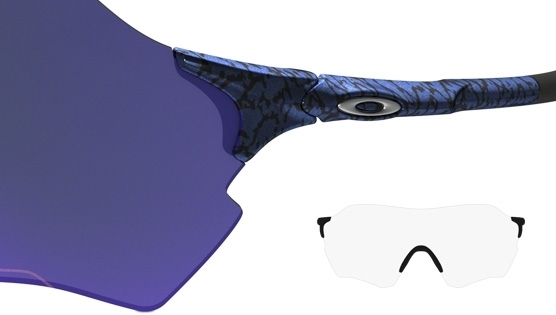 At the pinnacle of performance eyewear stands Oakley, uncompromising excellence in functionality. The lightest performance sunglass, the Evzero from Oakley has a rimless toric shield for brilliant peripheral vision. Green Fade with Prizm Field Lens. Carbon Fiber with Prizm Trail Lens. The sport lenses on the entire EVZero range extend the critical angles of view with razor-sharp clarity and are engineered to optimize vision for specific environments and activities. Available in number of lens shapes you'll find your perfect rimless sunglass here. This is the Range lens - the biggest of the EVZero family. Performance and styling worthy of the Oakley brand, the unique frames are crafted with Three-Point-Fit and lightweight materials that maximize impact protection and comfort. From occasional weekend enthusiasts to the world’s top athletes, those who want to achieve at their highest level choose Performance Sport eyewear from Oakley.